Materials have different properties that make them useful for different jobs. Here are some properties that materials have. Transparent materials do let light through (you can see through them). Opaque materials do not let any light through (you cannot see through them). 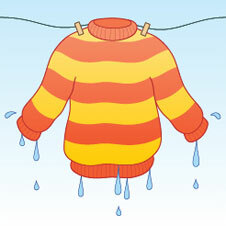 Waterproof materials do not let water through and do not soak up water. Absorbent materials soak up water and let water pass through them. Strong materials are very difficult to break. Weak materials break easily. Flexible materials are easy to bend. Rigid materials are difficult to bend. Hard materials are difficult to scratch. Magnetic materials are attracted to magnets. Some materials are good conductors of heat. This means heat can travel through them easily. Some materials are good conductors of electricity. This means electricity can travel through them easily. 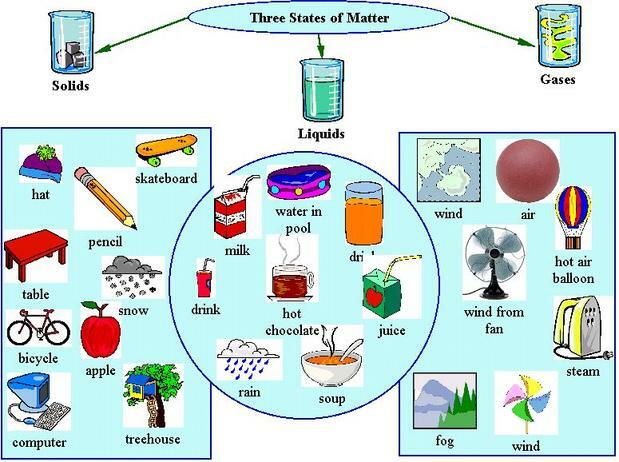 There are three main states of matter. They are SOLID, LIQUID, and GAS. Each of these states is also known as a phase. Each state has different properties. 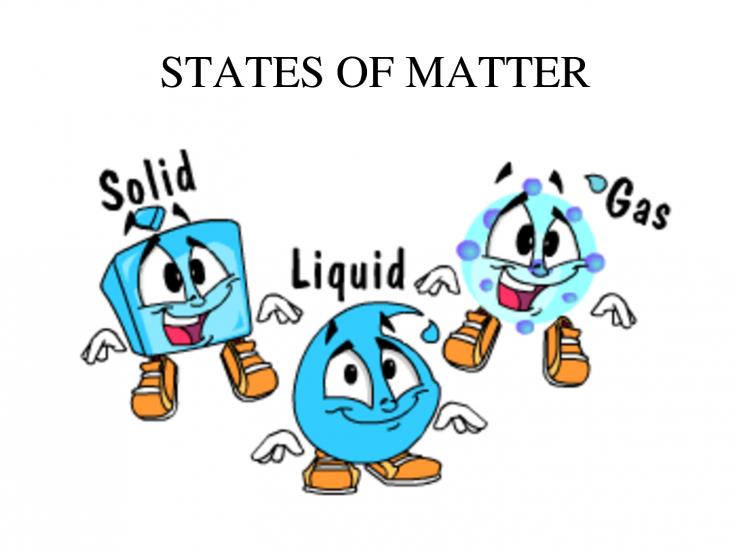 The state that matter is in depends on how much energy atoms have. 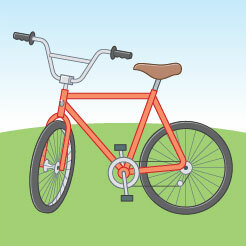 Solids have three main properties:# It has a definite shape. It has a definite mass. It has a definite volume. This means that a solid will always look the same, take up the same amount of space, and have the same amount of molecules in it. 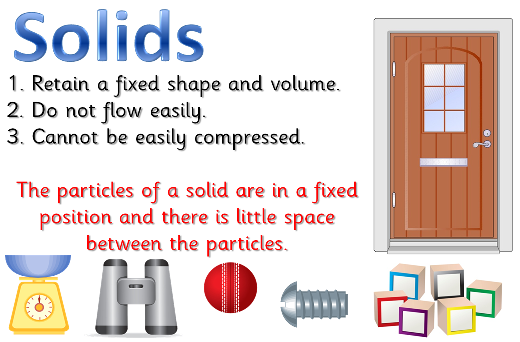 A solid has a definite shape and volume. The particles inside the solid can be arranged in neat rows, or just randomly. The solids with neat rows are called crystalline solids, like diamonds, salt crystals and ice. The solids with random rows are called amorphous solids, and the texture is described as rubbery or glassy, like rubber, glass, and wax or plastic. When a solid is heated enough it changes into a liquid. A solid is particles of matter that are touching but cannot be moving. It does not have a definite shape. 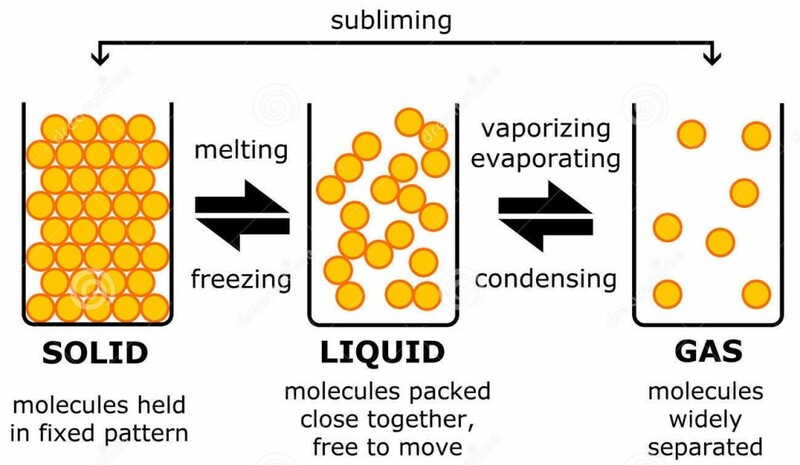 This means that liquids will always take up the same amount of space and have the same amount of molecules in it. However, because it does not have a definite shape, it takes the shape of its container. A liquid has a definite volume, like a solid, but unlike a solid, a liquid will take the shape of the container it is poured into. Liquids are described as a fluid. A fluid is a substance in which the particles inside of it can move freely past each other, like a gas. 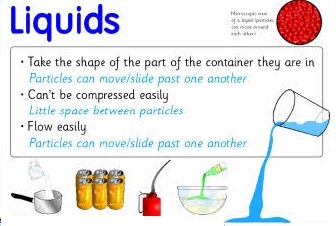 Like a solid, the particles inside of the liquid are very close to each other. 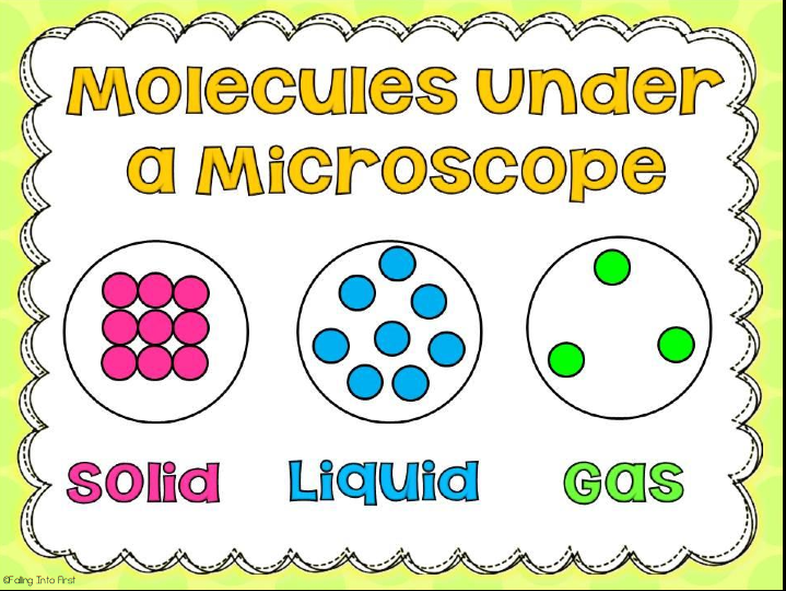 A liquid is a mix between a gas and a solid. When a liquid is heated enough it turns into gas. A liquid is particles of matter that are touching, but can move freely past each other. It does not have a definite mass. This means that a gas does not always take up the same amount of space, nor does it weigh the same all the time. Like liquids, gases take the shape of their containers. However, they will fill the space they are given. That is why they don’t always take up the same amount of space!! 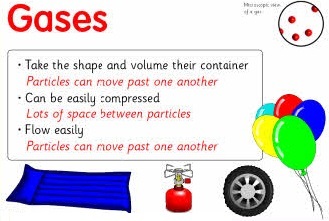 A gas can easily change its shape and volume. A gas is referred to as a fluid, just like a liquid, and a gas takes up all available space, as quickly as it can. Gases can easily be compressed, unlike a liquid or solid. 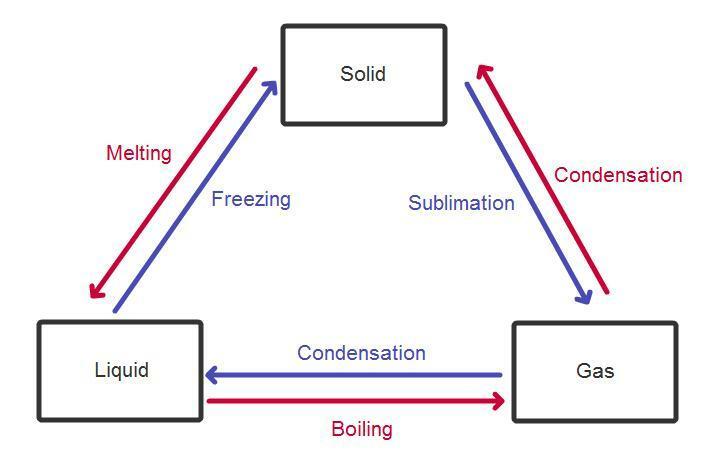 When a gas is cooled enough it turns into a liquid and the liquid if still being cooled will turn into a solid. 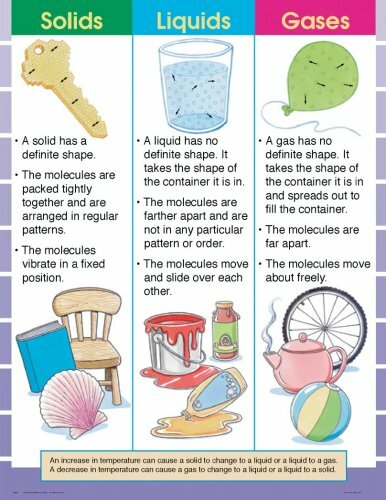 Gases are usually not visible, unlike liquids and solids.Gases are many pieces of matter that are not touching and are moving very fast. Water vapour doesn´t have a definite form or a definite volume. Get yourself registered in these online classes. Join Online Classes from anywhere, at anytime from comfort of your couch.